Mon., Sept. 5, 2016, 6 a.m.
"Chopper Command" took the successful formula of Williams' "Defender" to a desert locale and into the homes of Atari 2600 owners. Before home consoles could emulate the graphical prowess of arcade machines, there were dumbed-down versions of coin-guzzling classics brought to living rooms. Some (see: Pac-Man) were abject failures. Others managed to capture the gameplay of their counterparts and earn a cult following, despite the less impressive look. Enter "Chopper Command," sometimes called "Defender in the Desert." 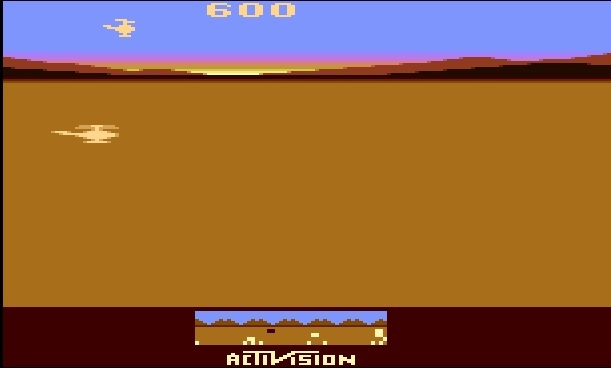 You can play this Atari 2600 classic by clicking the link below, thanks to the folks at the Internet Archive! Click here to play "Chopper Command" free in your browser! The goal of Chopper Command was simple: move your chopper to the right or left on the screen, avoid enemy fire and give them your own flavor of lead as you rack up the points. If you earned 10,000 points, you could take a picture of the screen and send it in to Atari to earn a "Chopper Commandos" patch. You can find them for less than $20 on e-Bay, should the mood strike. The game was designed by Bob Whitehead, an Atari employee who left to found Activision, the world's first independent developer and distributor of games for home consoles. Chopper Command released in 1982, a full year after Williams Electronics' classic "Defender" hit arcades. These were the early, Wild West days of gaming, and the highly derivative formula prompted no lawsuits. Whitehead would go on to establish the company Accolade in 1984. While there, he developed Hardball, the baseball video game you can see Fred Savage playing at the beginning of the 1987 film "The Princess Bride." Do you have a Chopper Commandos patch? What's your favorite Atari 2600 game? Let us know in the comments below, and check back next week for another free game!